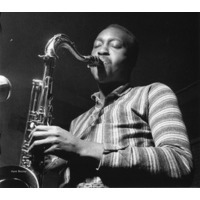 Henry (Hank) Mobley (July 7, 1930 – May 30, 1986) was an American hard bop and soul jazz tenor saxophonist and composer. Mobley was described by Leonard Feather as the "middleweight champion of the tenor saxophone", a metaphor used to describe his tone that was neither as aggressive as John Coltrane nor as mellow as Stan Getz. In addition, as his style was laid-back, subtle and melodic, especially in contrast with players like Sonny Rollins and John Coltrane, it took connoisseurs until after his demise to fully appreciate his talent. The critic Stacia Proefrock claimed he is "one of the more underrated musicians of the bop era."